The Fox Air Bed is a particularly great choice for taller people who are worried about bed length. It has a built-in two-way pump, plus works with any external pump. The Fox Air Bed also rests high off the floor, making the sleeping experience more like a regular bed. 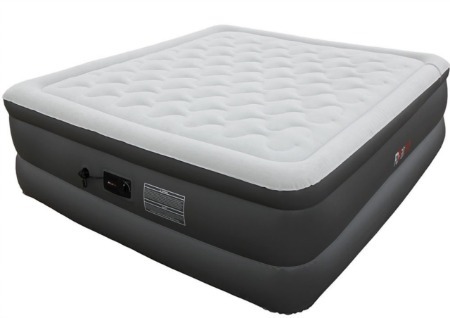 This air bed can be used for guests, traveling, camping trips, moving, additional sleeping space, and as a substitute for a traditional mattress. For around $100, this air bed can easily be yours, which is a much cheaper option than the conventional mattress. Below is an in-depth review of the Fox Inflatable Air Bed. The Fox Inflatable Air Bed is good for supporting your body but is especially great in an emergency. For example, when you have to travel somewhere or move to a new location right away but don't have the means to bring a real mattress. With regards to its structure, Fox Inflatable Air Bed is sturdy and remains inflated throughout the night. In fact, you won't have to pump additional air into the mattress after it is already set up. A lot of air mattresses, and mattresses, in general, tend to run on the shorter side. However, this mattress isn't stingy with space, so you can comfortably lie down and enjoy a good night's rest. 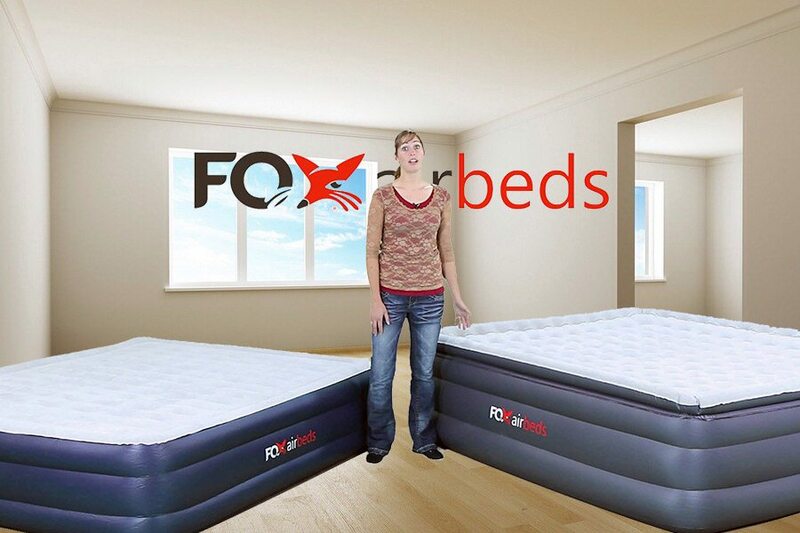 The Fox Inflatable Air Bed is particularly ideal for taller people who are worried about bed length. This bed rests high off the floor, making the sleeping experience as comfortable as possible. Keep in mind that you can also place this air bed on a traditional bed frame for more structured support. This mattress feels perfect for the body and is even good for people with back aches and body pain. Who Will Love This Mattress? People who frequently travel, especially for work, will benefit from purchasing the Fox Inflatable Air Bed. This air mattress can be compressed, folded, and taken anywhere. It barely takes up any luggage space or weight. It can be transported from place to place very quickly, making it suitable for people on the go. Those who get a lot of overnight guests will also benefit from this smart buy. Having an air mattress on hand is always great when you're receiving a guest. It's also a lot more affordable than buying a traditional mattress for the guest space. By purchasing an air mattress, you can save money on your guest visits. This purchase is ideal for people who need a temporary, or even permanent, replacement for the traditional mattress. If you're moving to a new home but don't want to pay movers to move a heavy mattress or don't have the money saved to buy a traditional mattress, an air mattress works great as a replacement. The Fox Inflatable Air Bed is very easy to set up and inflate. It has a built-in two-way pump. It also has external pumps. 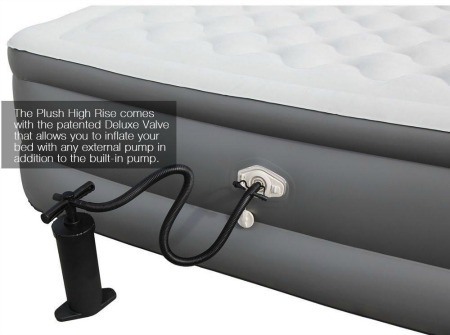 You can inflate or deflate the mattress through any pump you prefer. This mattress is part of the Plush High Rise Collection. Upon receiving other air mattresses, many people feel as if they have to stretch them out to get them to inflate properly. On the contrary, this collection promises to inflate to its correct directions right away. 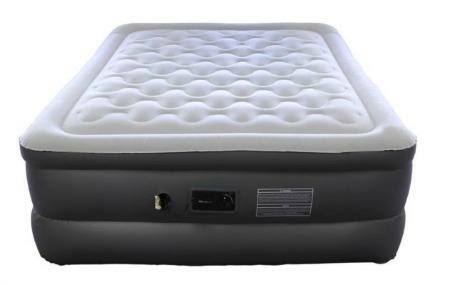 The mattress has a deluxe release valve and pillow top airflow chambers for the best performance possible. The Fox Inflatable Air Bed aims to be true to size, so its dimensions are measured from the actual sleeping surface. There are no bulges or strange corners. This bed comes in the sizes twin XL, full, and queen. This air mattress is made of 43% thicker vinyl. This means that the bed is soft yet durable. It won’t tear, rip, or sink under pressure. The mattress will stay full no matter what. The mattress can also hold a lot of weight—the queen size has a 500lb capacity. This mattress is high-rise which means it has a rising top thickness rather than staying low to the ground. It can be put on a traditional bed frame to be higher up from the ground, which gives the air bed a more traditional mattress look. The face of the bed is white while the perimeter is gray. The Fox Inflatable Air Bed is extremely convenient because even when it is blown up, it is still lightweight. After being inflated, it weighs 17 lbs, which makes it super easy to carry, lift, and maneuver. Because this mattress can deflate, it can be folded up and brought anywhere. It can even fit in a purse. It can also be stored away for maximum home space. This air bed is very convenient because it can work well in case of an emergency. If you have to leave or travel last minute, or someone in need needs a place to stay, you’ll have a bed for the occasion. 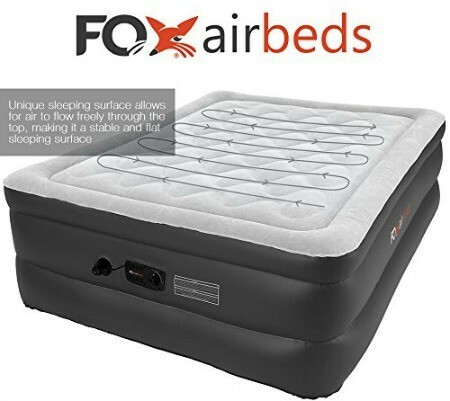 The Fox Inflatable Air Bed is affordable and highly functional and can be used in various scenarios to provide a comfortable place to sleep on. 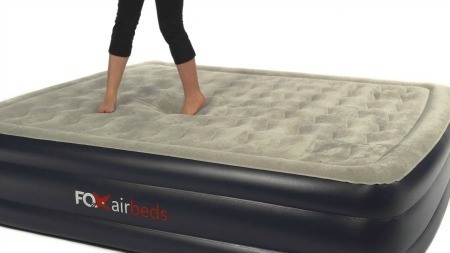 If you are a taller person in need of an airbed, make sure to purchase this brand! Its sizing is accurate and will not leave your toes hanging off the edge. For extra warmth and comfort, you can purchase a cheap $10 or $15 foam mattress topper as an additional layer of support. If there is an issue with your product, contact the manufacturer! Fox Air Beds is very helpful. Based on positive customer review, this airbed is worth the price tag. It is one hundred percent a dupe for a traditional mattress, so you’ll be saving money by choosing this Fox Inflatable Air Bed over standard mattress models. The best place to order this airbed from is Amazon since the retailer provides free prime shipping. I would highly recommend purchasing the Fox Inflatable Air Bed. The bed is true to size, comfortable, and convenient. This is a multi purpose mattress that would be perfect for almost anyone.